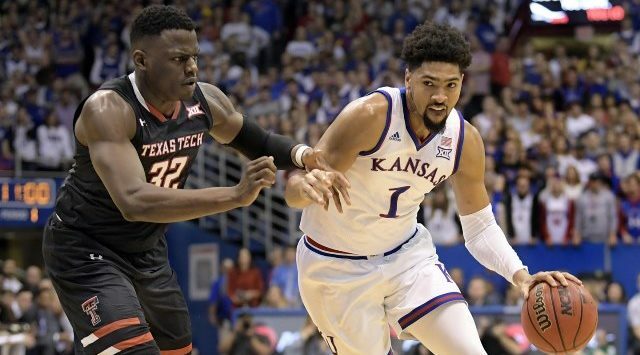 St. Louis – Kansas redshirt-junior Dedric Lawson has been named U.S. Basketball Writers Association (USBWA) All-America Third Team, the USBWA announced Monday. Just last weekend, Lawson was named to the Big 12 Championship All-Tournament Team where he averaged 19.3 points, 7.3 rebounds and 2.0 steals in three games. On most every All-America team and national player of the year list, the Memphis, Tennessee, forward leads the Big 12 in scoring at 19.1 ppg, rebounding at 10.3 rpg and with 20 double-doubles. The Big 12 Newcomer of the Year and All-Big 12 First Team selection, Lawson is the only player in the league averaging a double-double. A three-time Big 12 Player of the Week (11/12, 11/26, 12/26) and five-time league newcomer of the week (12/3, 12/17, 1/14, 1/28, 2/11), Lawson leads KU with 36 blocked shots and his 1.1 blocks per game are sixth in the conference. Lawson is 11th in the Big 12 with a 48.8 field goal percentage. Historically, Lawson has 56 career double-doubles, which are fourth on the NCAA Division I active list. He is the only non-senior on the NCAA Division I top-10 list. Lawson’s 20 double-doubles this season are fifth on the KU single-season list and he is one away from moving into a tie for third.